As part of a Board Chair Series, Leadership Metro Richmond, The Community Foundation and Sands Anderson brought together Board Leaders from around Greater Richmond to learn and discuss best practices for building effective organization leadership – particularly around the relationship between the Executive Director (ED) and Board Chair. 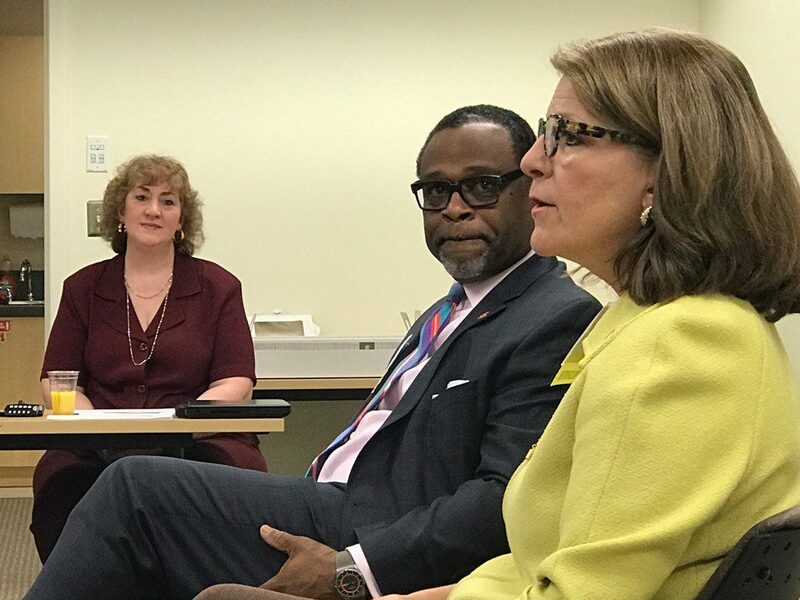 The CEO of ChildSavers Robert Bolling, along with Immediate Past Chair Linda Schreiner, talked in-depth about how they created an effective working relationship during their tenure of leading the organization together. For those who aren’t familiar, ChildSavers works to ensure that all children are safe, healthy, happy, and ready to learn. They provide immediate response, outpatient mental health counseling and early childhood development services so that children have a chance to reach their potential and thrive. Robert joined ChildSavers in 2012 and immediately began making major changes to the organization that had been under the same leadership for several years. Robert, along with the guidance of the Board, and especially Linda, set out on a strategic planning process and rebrand for the organization. Building a successful relationship between the two was incredibly important to guiding the organization and Board through this period of transition and change. 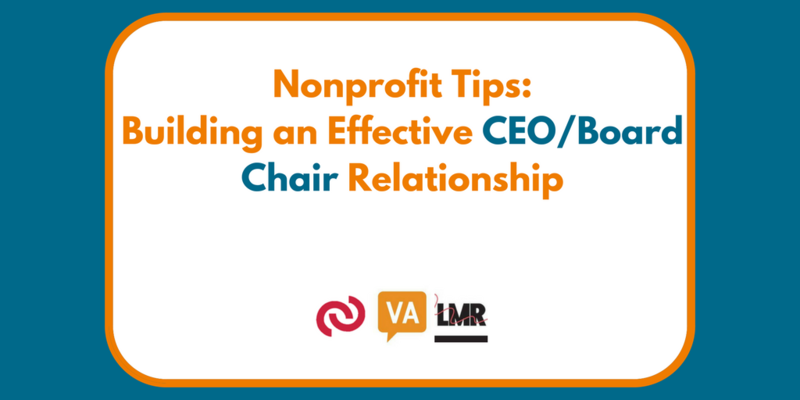 Robert Bolling, CEO of ChildSavers and Linda Schreiner, Past Board Chair, share tips on building an effective CEO/Board Chair relationship. Building a foundation of trust, understanding and respect is arguably the most important factor in a successful ED/Board Chair relationship. Robert and Linda said first they had to get to know each other’s style, personality and background. Because they began their working relationship during a time of organizational transition and change, they had to start having difficult and fierce conversations early on; and knowing each other’s approach to problem-solving, motivation and communication was key to doing so. Linda praised Robert for being very self-aware and open to feedback. This inspired Linda to do the same and it allowed them both to create the safe environment they needed to build trust with one another and effectively run the organization. Separating management and governance duties can be mucky and muddy when leading a nonprofit organization. Many times, a board chair began as a volunteer for the organization and it can be difficult to adjust from that role to one with higher-level duties. It’s incredibly important to determine upfront what a formal decision is and what isn’t, what requires board oversight and what doesn’t. When you’re first beginning the ED/Board Chair relationship, setting up standard operating procedures will help. You may want to even take the full board through a formal process of defining oversight, like ChildSavers did. For example, as the Board Chair, Linda would approve any spending request over $5,000. Robert and Linda worked together on a compensation and performance review process for Robert that went to the Executive Committee of the Board for approval. Overall, it was imperative that they work together to create guidelines on decision-making as a first step to a great working relationship, as well as distinguish between their unique roles. Both Robert and Linda thought it would be helpful to provide continuing education for the Board and subcommittees during the period of cultural change and transition; helping them fully understand the organizational shift and to encourage their ongoing investment in ChildSavers’ mission. Reiterating new messaging became important, so the new mission and vision were written out at the top of each board agenda. At every Board meeting ChildSavers’ staff were brought in to share “Mission Moments” and deep dives into their programming. Families positively and profoundly impacted by the organization were brought in to share their stories. The two even coordinated tours of the neighborhoods that ChildSavers typically works in. Robert and Linda working together to educate the Board was not only critical for better decision-making and deeper investment from the Board, but also important in showing the Board a solid and consistent “front” from the two leaders of the organization. Succession planning shouldn’t be a taboo topic between the Board Chair and Executive Director of the organization. In fact, it should be discussed often. Robert says that he frequently has discussions with his Board Chair about his vision for his role, as well as how he is planning to groom staff to grow into leadership roles. On the Board side, Linda was constantly planning how she would create a smooth transition for her successor Clayton DeArment, who is now the ChildSavers Board President. Getting to know his personality and communication style was important, she said, as was bringing him into important conversations as her term came to an end. Ultimately, passing on knowledge, wisdom and advice proved to be a successful way to transition the role of Board Chair to Clayton. When he first joined ChildSavers, one of Robert’s first priorities was changing the organization structure from very flat to one where staff could grow and advance. “Often in nonprofits, great staff won’t stay with an organization because there is no room to grow or advance,” he said. In addition to organization structure changes, he invests in staff development through classes, trainings, conferences and even leadership programs like Emerging Nonprofit Leaders offered by The Community Foundation. But, he cautions, it’s important that both the Executive Director and Board understand the importance of this type of investment in staff and organizational growth, because at the end of the day “growth must be funded” and we look to the Board to take on this role. We want to sincerely thank Robert and Linda for sharing insights with Board Members across the region, and we want to thank LMR for being a great partner in our “Board Chair Series”! Are you bringing on new Board Members soon? 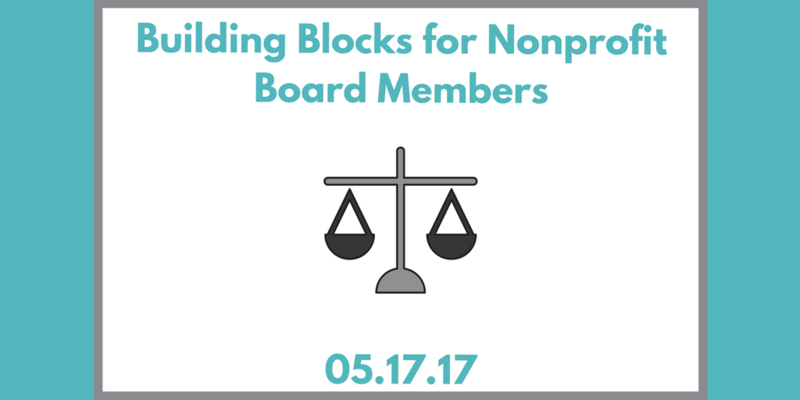 Use the Building Blocks for Nonprofit Board Members workshop on 5/17 as a part of your orientation process! Participants will get an intro to the nonprofit sector, nonprofit organization and board lifecycles, an overview of board roles and responsibilities, and resources for continuing board development and growth. You can register here.